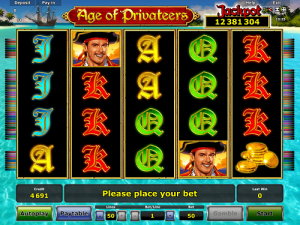 Age of Privateers is a 5-reel, 50-payline slot game from Novomatic. Step back in time and step aboard the most dangerous ship that’s ever sailed the seven seas! The Privateer is currently anchored in a small cove, just off the coast of a tropical island. The water is pristine, turquoise and clear. There’s a crew of pirates on board this heavily armed Privateer, and they’re searching for treasure. There are male pirates as well as female pirates. Join them and see if you can too find your fortune! Age of Privateers is a Novomatic slot with a 94% RTP. This is just under average for this developer. There are slots that pay out more but Age of Privateers has a massive, progressive jackpot that goes well into the tens of thousands! There’s also a Free Games bonus to be won and during the Free Games, all of your wins are quadrupled! Age of Privateers will be enjoyed by fans of Red Lady, Sharky and Lovely Mermaid, also by Novomatic. You can put your wins on the line with the gamble feature. You can also put your fingers to rest with the autoplay feature! There’s nothing you won’t love about Age of Privateers. The symbols in Age of Privateers are so colourful, they could be seen all over the Seven Seas! All of the symbols, although slot-themed, have a pirate feel to them. Even the lowest-paying symbols are pirate-tastic! These are the 10, Jack, Queen, King and Ace. They’re typical slot symbols but pirates, like casino players, enjoyed playing cards! How else would you pass the time on board a ship for weeks at a time? Don’t forget, the Age of Privateers came way before the invention of television! Higher-paying symbols include: barrels of TNT, a stack of golden coins, a compass, a privateer ship, a happy female pirate, a happy male pirate and a ship’s wheel! The beautiful female pirate is the only symbol which can pay from two matching symbols. All of the other symbols will only pay from three matches. You have to get the right number of matching symbols to get a payout, as well as getting them to land in the right place! This means landing the first of the matching symbols on the leftmost reel and landing the other symbols on adjacent reels towards the right, on an active payline. Age of Privateers has 50 paylines in total but you can choose how many you want to activate and bet on. Then, you can set your bet per line. All of these settings are controlled at the bottom of the screen. The happy male pirate is a rather special pirate! He’s Wild! If there’s a win that’s just one symbol short, he can step in to make it happen! As long as he’s in the right place, he can be a substitute for any symbol. Except for the Scatter as this has rules of its own! The Scatter symbol is the ship’s wheel symbol. This pays from any position, as long as there enough of them! Land three Scatters, in any positions, and you’ll get a payout. 3 or more Scatter symbols do not only give you a payout but they also start the Free Games feature! In Age of Privateers, 3, 4 or 5 Scatters trigger 12 Free Games. These start immediately and all every single win that you get during the Free Games will be quadrupled as they come with a 4x multiplier! The Scatter symbol is present on the reels during the Free Games, so you’ll always have a chance to win more whilst they’re still going! Remember the happy male pirate? Well not only is he your best friend during the normal game, he’s also your best friend during the Free Games. He still acts as substitute but during the Free Games, he’s also stacked! That means he’s there to help you many so many more wins. Not just that, he’s also the symbol that’s going to help you get that jackpot. If you manage to fill the whole screen with his smiling face, the progressive jackpot will be yours for the taking. All in all, you’ll need to fill every position on every reel, that’s 20x happy male pirate symbols in a single spin to be awarded the massive jackpot. Although don’t live in a time where these ships sailed the seas, in this day in age you can still with the Age of Privateers jackpot!